A stunning secret garden close to Buckingham Palace; a sumptuous three-course dinner; summer cocktails; live music of the highest quality; what more could you ask for? Good weather, evidently. This is the UK after all. Luckily, when I visited 51 Buckingham Gate – the luxury five star hotel whose courtyard we were due to be wined and dined in – the staff were more than prepared for London’s fickle weather and instead herded us into one of their luxury banquet halls to enjoy a night of frivolity. 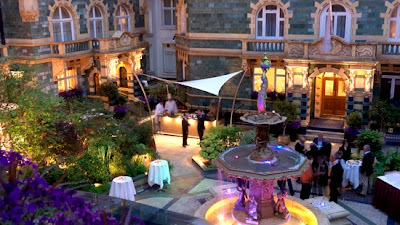 During the months of July and August, the picturesque courtyard – housed within 51 Buckingham Gate – will fling open its gates for a summer of alfresco dining and late night cocktail sipping beneath the stars, completed with a wealth of West End musical classics performed live by opera stars. Spread across Friday and Saturday evenings throughout the summer, The Courtyard will present operatic numbers as well as classic and hit contemporary favourites from the West End (performed by the wonderful Soprano Bella, Cantabile, The London Quartet and Viva Live Music) while diners feast on a three-course meal served with a selection of fine wines and Champagne. Expect to hear songs from Phantom of the Opera, Les Miserables, Miss Saigon and West Side Story. Despite the dreary weather and indoor setting, on this particular night, we soaked up the atmosphere and enjoyed the music as our meal was served: a fresh Greek salad to start, the gin braised lamb shank main, and iced honeycomb parfait to finish. The talented cast had us all up dancing immediately with hits from Mamma Mia and Grease (go on, try telling me you could resist). Tickets were priced from £75, which included the three-course dinner and delectable signature '51' cocktail. Let’s all hope for more clement weather when you visit. Wow! That's just amazing place. I just came back from the London, but the next time, when I I'll look for london events (follow the link and find a good one for yourself), I'll surely mention this place in my "must visit" list. I:you want to go there, but you don't have somebody to go with you, just message me and we'll go there together. And if you're a foreigner like me, that's even better. Photos: Is This The Best Breakfast View In London?